Cover Title: "In Final Battle!" Title: "Invasion Of The Body Changers!" The Nova Prime Starship has spent the last two weeks rocketing towards its rendezvous with Xandar. On board, Powerhouse announces that the ship is about to enter Phase Condition, a warp drive which will allow them to reach Xandar much more quickly. As the ship warps into Phase Condition, Nova asks the Sphinx how he had survived his previous encounter with the Fantastic Four. Nova's greatest foe explains that it was the unexpected power of Black Bolt which defeated him. As he hurtled through space, the Sphinx was able to land on a small moon. He spent the next year regenerating his power and expanding his thoughts throughout the cosmos. The Sphinx continues to explain that a few weeks ago, his mind sensed an approaching space vessel. On that ship was the Fantastic Four's foe, Quasimodo. After fleeing the FF in their space vehicle, Quasimodo had detected the Nova Prime Starship in Earth orbit while the Sphinx silently observed. Realizing the spacecraft Quasimodo detected was Nova's, the Sphinx forced the foe of the Fantastic Four to bring his vessel to him. On Quasimodo's ship, the Sphinx scanned its pilot and realized that he was a cybernetic construct. Stealing Quasimodo's ship, the Sphinx returned to Earth orbit. He entered the Nova Prime Starship, scanned the computers and found Dr. Sun and Nova aboard. The Sphinx also informs Nova that Xandar's Living Computers still exist! In another part of the starship, the Comet and Crimebuster continue their father/son reunion. Seeing them together causes Nova to miss his own family back on Earth. Meanwhile, the Rider family continue to worry and pray for their son's safety. Back in the control center of the Nova Prime Starship, Powerhouse tells Dr. Sun to leave the controls alone per the Sphinx's orders. Dr. Sun refuses to listen and finds his robotic arm crushed by the Sphinx! A fight breaks out as Nova and the Comet attempt to stop the Sphinx. Another of Nova's foes, Diamondhead, joins in the battle against the Sphinx! The combat ends abruptly as the Nova Prime Starship is attacked by a fleet of alien warships! Nova, Sphinx, Comet and Powerhouse leave the ship to fight the alien attackers. 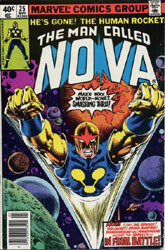 Ripping through their ship's hull, Nova realizes they're fighting against the Skrulls! The shape-shifting aliens are no match for the combined powers facing them! Using his full power, Powerhouse destroys an entire Skrull warship! The Skrull warships turn and begin heading back to their homebase. Inside, Diamondhead attempts to take over control of the starship but is ordered to stop by Crimebuster. Before he can crush the crimefighter, Diamondhead finds himself frozen by the Sphinx! The powerful Egyptian tells his diamond-skinned foe that he will let nothing interfere with his destiny on Xandar including the fleeing Skrulls! CONTINUED IN FANTASTIC FOUR #204!